Buckle yourself in and get ready to experience some electrifying wins on the reels! The Sparks slot machine from Net Entertainment sees you whisked off to a galaxy far away with a blue/purple haze lingering all around before brightly coloured shots of energy blast around the place – and you better be on your guard as the combination of different energies clashing together could see the reels burst into a ball of flames for red-hot wins! The tranquil sounds you’ll hear as you spin the reels are certain to put you at ease in this 5-reeled slot which contains 20 fixed paylines and you’ll be pleased to hear that the range of coin values on offer means that there are 80 different betting combinations to choose from, enabling you to visit this energised galaxy from 20p up to £400. With five different sparks of energy bringing vibrancy to the reels, you could find yourself winning up to 80,000 coins as you choose how to play and enjoy Expanding Cloning Wild symbols! 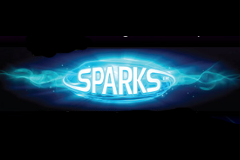 Upon loading the Sparks slot machine, you will be prompted to select whether you’d like to play Win One Way or Win Both Ways with your decision seeing the RTP alter ever so slightly from 96.56% to 96.54% respectively. If you opt for Win One Way your winning combinations will be awarded from left to right as usual with a misty blue background used while opting for Win Both Ways sees you awarded wins from both left to right and right to left with the colourful energies dashing across a dark purple background instead. Thankfully, Net Entertainment have made it easy to switch between the modes with a button below the reels rather than you having to reload the game. No matter which mode you opt for, you’ll be witnessing the glowing energies falling on transparent reels with the ‘zapping’ sounds of energy ringing out when you land a winning combination. An orange ‘W’ surrounded by a glowing light blue sphere is the standard Wild symbol here and it can substitute for everything but the other special Wild, but more on that later. In addition to being Wild, it is also the joint-highest valued symbol in this galaxy as it pays 40, 150 and 400 coins for three, four or five on a single respectively. These payouts are the same for the red burst of energy, while you will also see orange energies worth up to 350 coins, green energies worth up to 300 coins, purple energies that are worth up to 250 coins and sky blue energies which are worth a maximum of 200 coins. Completing the line-up of symbols are Ace to 10 icons which have been designed with an energetic twist and these are also coloured red, orange, green, purple and blue respectively with their payouts ranging from a maximum of 100 coins to a maximum of 60 coins. In addition to the standard Wild symbol which can land on all reels, there are special Expanding Cloning Wild symbols too, although these can only land on the second and fourth reels. These flaming energies possess the ability to expand vertically, horizontally or both ways in order to cover a whole reel with the symbol to its left being cloned and replicated to its right in order to guarantee a minimum three symbol winning combination. For example, if the Expanding Cloning Wild shows on the fourth reel, the symbol on the third reel would be copied to the adjacent position on the fifth reel. This is where I find the largest wins come from when playing the Sparks slot machine and often you’ll be congratulated with a ‘Super Mega Win’ message splashing across the screen which never fails to spark you into an excited mood! Tranquil sound effects may ring out to make you feel calm and relaxed while spinning the reels of the Sparks slot machine, but as those vibrant energies gyrate around the reels and form winning combinations they’ll spark a lot of excitement from within you – especially when you land the Expanding Cloning Wild to witness it work its magic and whenever you see the ‘Super Mega Win’ message zapping across the reels!